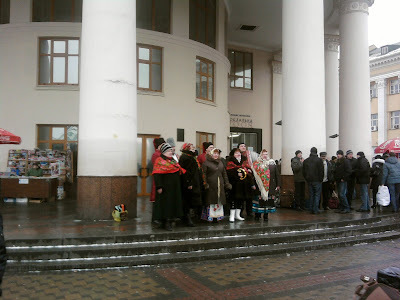 ← News From Russia: January 30th, 2009! 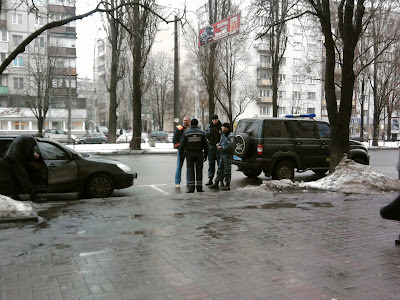 From Russia: Pictures From Ukraine on the Business Trip! 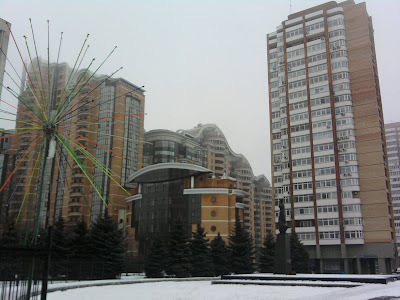 Just some pictures of Ukraine. I spent most of my time in areas that I could not take pictures but when I could I took some shots of the scenery as I walked from office to office. 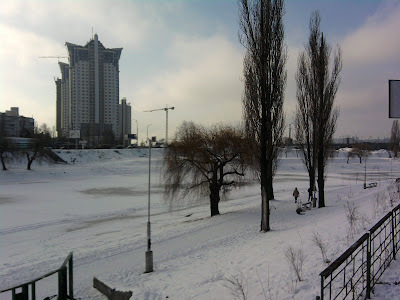 The scenery in Ukraine is almost like Russia. 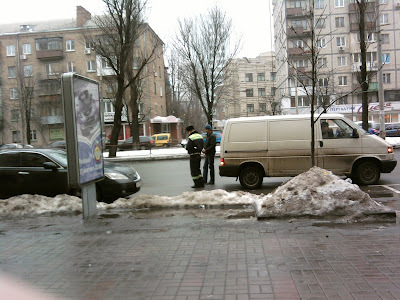 So I am as comfortable in Kiev as in Moscow. 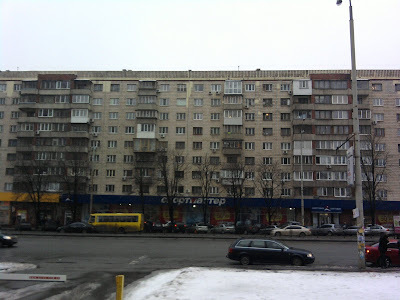 Picture above: This is new Flats (Apartments) in Kiev! Compare to Soviet era below. 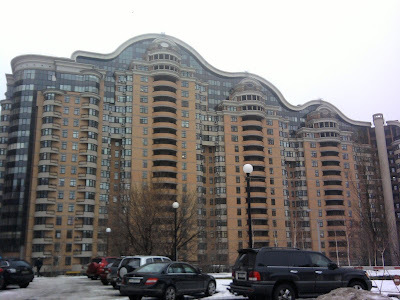 The Soviet era flats above are located just across the street from the new Flats in the first picture. Above: I liked the decoration is why I took this picture. I think that it is a New Years Decoration and it was all lit up at night. 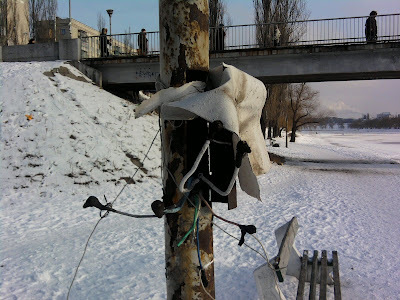 Below: These wires believe it or not were alive. If you touched several of them together the light pole lit up. Of course I being curious had to play with them! 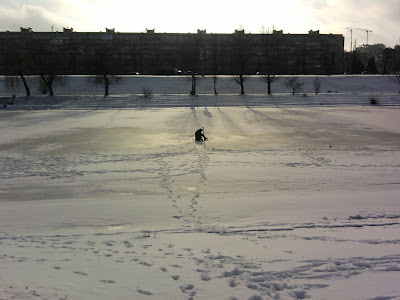 Below: I loved my walks in Kiev! 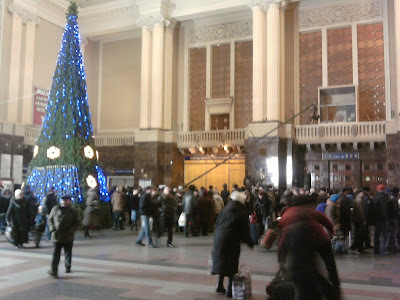 Below: Inside Kiev Train Station – It is like this 24 hours a day! 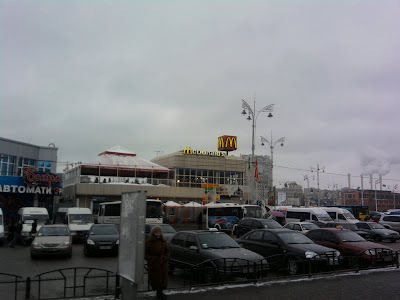 Below: Kiev 24 hour McDonald’s at the train station – Always very busy! Below: Singing for Money and they were very very good! 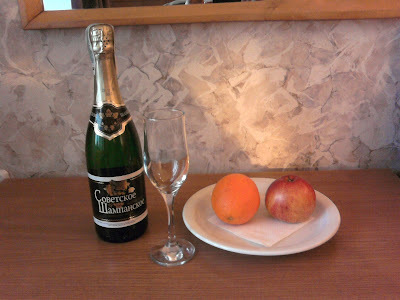 Below: My Birthday Champagne from the Hotel! 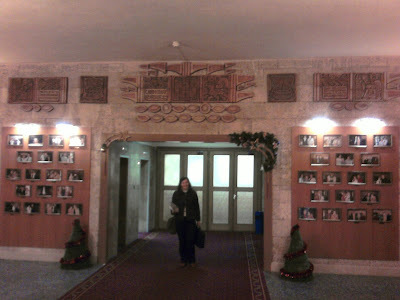 Below: The Lobby of the Hotel and Svetlana! 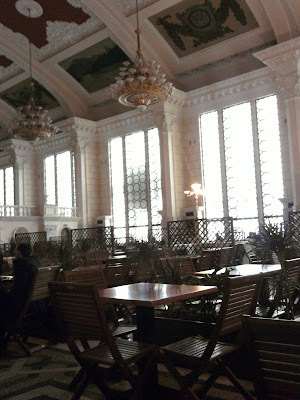 Below: A Cafe at the Train Station not very busy considering thousands of people an hour go through the station!